American visions : the epic history of art in America · One Book. One Author. One Hour. Notes on front endpapers: What's the politics of artists--any right wingers. Hopper p 422; Grant Wood p 440; Thomas Hart Benton 442. Underlinings/Notes: Underlinings: Not scholarly text, Australian, American Indians immigrants, Met in NY greatest, Spanish in North America before English, Puritans compared John Winthrop to Moses, Novus ordo seclorum, Salem 1692 19 women hanged, New Englanders suspicious of luxury, New England--painters useful for crests and portraits, Death omnipresent in Puritan culture. Lamb underlines details on artists' lives as well as information on collectors and the relation of art to American life, culture, mores and history. Notes: "24,000 v. 180,000 words," "general intelligent reader," "left wing view of the Met," "work ethic, religion," "arrival of Puritans," "1630 Winthrop, City on a hill," "radical newness," "newness of America," "New England," "1615 Native Indians," "oldest wooden church," "artists," "John Winthrop portraits," "painted child in," "death," "the tombstone," "[Edward Hopper] dead 30 years," "Thomas Hart Benton, Grant Wood, Jackson Pollock," "a conservative Willkie supporter," "definition of abstraction," "his wife," "Time Thomas Hart Benton self-portrait," "Wood-a homosexual," "Eldon, Iowa most famous house in America," "Wood's work sly, comp, gay sensibility," "Regionalism," "Benton-father in Congress, grandfather a senator," "Benton and homosexuality," "devious queer," "fairie," "abstract painter, Jackson Pollock, died 1956 v(44) Life mag.," "alcoholic," "Claes Oldenburg born in Stockholm 1929, raised in Chicago," "America very little religious art," "Americans new age of anxiety," "America 1968 to 1997," "artists vs. influence," "Maine woods," "Serra influenced Maya Lin," "the Earth Room," "Ed Kienholz," "Anti-American," "ask not! Identity politics and art," "patriotic correctness/political correctness," "future looks worse." 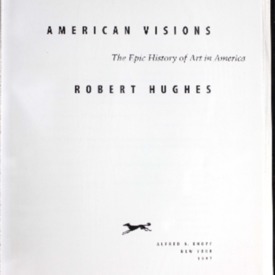 Hughes, Robert, “American visions : the epic history of art in America,” One Book. One Author. One Hour., accessed April 19, 2019, http://booknotes.gmu.edu/items/show/397.